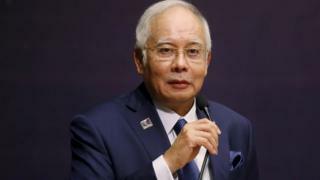 Malaysian PM Najib Razak is facing pressure internationally and at home amid US allegations of massive fraud at state investment fund 1MDB. The fund was set up by Mr Najib in 2009 with the stated aim of boosting the Malaysian economy. But FBI Deputy Director Andrew McCabe said evidence showed it had defrauded Malaysians "on an enormous scale". On Wednesday, US authorities moved to seize more than $1bn (£761m) in assets related to the fund. Mr Najib is not named in the US papers and has consistently denied wrongdoing. But he is identifiable as "Malaysian Official 1", whose account allegedly received millions in funds originating from 1MDB. The $1bn the US hopes to seize would make up only a proportion of the more than $3.5bn (£2.6bn) allegedly diverted. Where does US say the money was spent? aimed to boost the economy through investments and infrastructure deals with foreign entities including Saudi Arabia. What are the US accusations? that the money financed lavish lifestyles for "multiple individuals including public officials"
Mr Najib's stepson, Riza Aziz is named, as is Malaysian financier Jho Low, Malaysian Eric Tan, a United Arab Emirates official and a US citizen. What does the US allege the money was spent on? Mr Najib was officially cleared of criminality by the Malaysian attorney general earlier this year. He had dismissed the previous attorney general after he repeatedly criticised the prime minister's handling of the case. The current attorney general, Mohamed Apandi, said on Thursday that there was no evidence funds were misappropriated from 1MDB. Speaking on Thursday, Mr Najib stressed the US case was a "civil, not a criminal, procedure" and that "we don't want to come to any conclusions until that process [the investigation] is done". "I want to say categorically that we are serious about good governance," he said, adding that he would "fully co-operate" with the investigation. Despite denying any wrongdoing, the prime minister is now facing renewed calls to answer the accusations and stand down. Former premier and long-time Najib foe Mahathir Mohamad said there "can be no doubt" that Mr Najib was responsible for 1MDB's finances. He said Malaysians should stage street protests against Mr Najib, as they have in the past, and push for a referendum on his leadership. Parliamentary opposition leader Wan Azizah Wan Ismail said he should go on leave "so as not to create the perception of abuse of power" or hinder this "very important" investigation. When I spoke to the fund's CEO, Arul Kanda, in October last year, he told me "the value of assets outweigh the value of debt". But 1MDB had to sell some of its most prized assets in order to realise this value, and as one Malaysian opposition leader put it to me at the time, any business that has to do that isn't a successful business. 1MDB's financial mismanagement and the allegations of misconduct by the prime minister has raised concern amongst the foreign investment community that Malaysia's economy is in for a rough ride. But there are bigger worries than just the financial performance of 1MDB. At the heart of it is the suggestion that Malaysia's public money has been stolen and used for personal gain. 1MDB said in a statement last year that it had never given money to the prime minister and called the claims "unsubstantiated". Meanwhile Singapore fraud investigators said on Thursday they had seized more than $175m in assets connected to 1MDB and found several major banks, including Standard Chartered, had showed "weaknesses in the processes for accepting clients and monitoring transactions". Also on Thursday, the Swiss authorities said they had seized three valuable paintings linked to the investigation - one Van Gogh painting and two Monet paintings, following a US request. 1MDB scandal: What does US say money was spent on? Malaysia's 'mysterious millions' - case solved?